Lauren & Andy - A Barn at Boone Falls Wedding in Johnson City, TN from NICHOLAS & KEATON on Vimeo. Talk about an amazing wedding! When we heard Lauren and Andy were getting married at The Barn at Boone Falls, we were PUMPED to say the least. It's a super cool venue that's kind of a hidden gem in East Tennessee. It's got everything and more you'd want at a wedding venue, and Lauren and Andy took full advantage. They had people coming out of the woodworks for the wedding! Seriously, one of the biggest events we've been to all year, and they were all awesome friends and family who came out to show their love for them! These two are some of the most funny, honest and caring people we've ever met, and we tried our best to bring that out in their wedding film. Check it out! Courtney and Bryce - A Crossville, Tennessee Mountain Wedding from NICHOLAS & KEATON on Vimeo. Talk about an AWESOME wedding venue! Courtney and Bryce had their wedding on some land that belongs to their family. They originally told us it was going to be in the "mountains". When we arrived, we found out what they really meant... it was in the MOUNTAINS! It was an amazing day, in a gorgeous location, with some of the most encouraging and friendly family folks we've ever met! Meghan & Chris - A Knoxville, TN Wedding Highlight Film from NICHOLAS & KEATON on Vimeo. 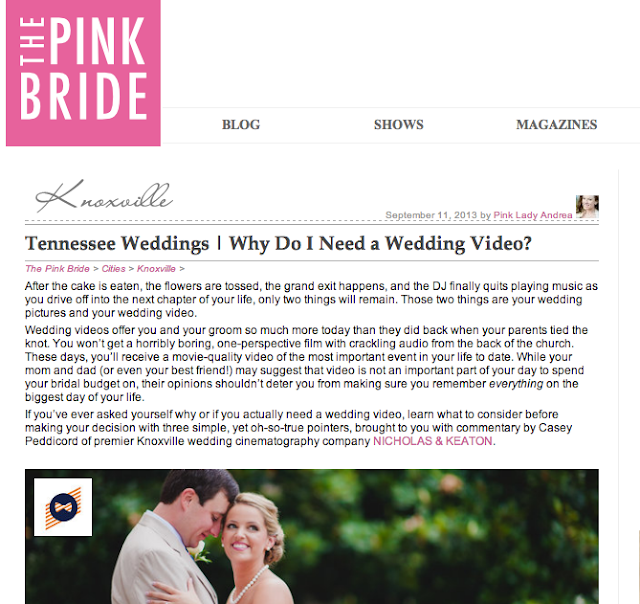 If you're on the fence about a wedding videographer, it will def answer some of your questions!